The presentation begins with a slide that says, “We have a lot to learn from geese.” Each slide that follows provides information about the reasons that geese fly in a “V” formation and the lesson we can learn from it. 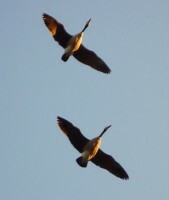 By flying in “V ” formation, the whole flock adds at least 71% greater flying range than if each bird flew on its own. Lesson: If we have as much sense as a goose, we will stay in formation with those who are heading in the same direction as we are. Lesson: It pays to take turns doing hard jobs, with people or with flying geese. Lesson: We need to be careful what we say when we honk from behind. Lesson: If we have the sense of a goose, we will stand by each other, protect one another and sometimes make new friends who seem to be going in our direction. I once heard someone say, synergy is best explained as, ‘One plus one equals more than two’. That is so true. In a church the implication become even greater because the combined impact of our efforts is eternal in its consequences.